1. Consumable items such as BD-R, CD-R, DVD-R and Printer Ink/Ribbons can not be re-sold after they are opened. Therefore we do NOT accept return requests for consumable items after they have been opened. 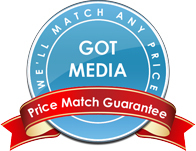 It is the customers responsibilty to make sure that media is compatible with their particular equipment. We will not accept returns for incompatability issues. 2. Defective merchandise will be accepted according to the vendor or manufacturer guarantee. Defective equipment and or Tech Support will be handled by the equipment manufacturer according to Manufacturer's Warranty. Defective merchandise is to be determined at our discretion. If product is determined defective it will be replaced with the same product that was returned as defective. 3. All return requests must occur within 15 days upon receipt of product. 4. All returns will incur a minimum of 15% restocking fee, in some cases the restocking fee could exceed 15%. 6. Return authorizations are valid for 30 days after their issue date. 7. Return authorization numbers must be clearly marked on the return label for each carton/box. 8. Return authorizations must be sent freight prepaid and insured. The customer is liable for lost or damaged merchandise. 9. Returned merchandise must be in original packaging and undamaged. 10. Any order that is refused by the customer after shipment will be subject to a 15% restocking fee plus freight charges to and from the ship address. 11. At our discretion we may waive our restocking fee for customers who place a new or "replacement" order for equal or greater value. 12. Closeout merchandise and special order products cannot be returned for any reason.